You’ve had this brilliant idea that solves a problem or adds value for customers. You’ve just won a big contract and now need to increase your stock levels, or perhaps you have grown a business over the last few years and are looking to expand into a new market. Your funding options depend on several factors, including the nature of your business, your ambitions and your business growth stage. 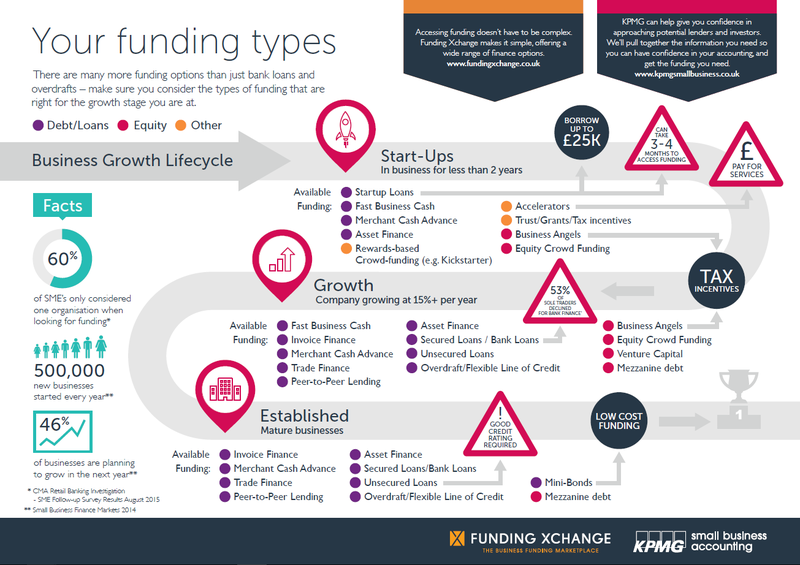 Funding options suited to mature businesses probably don’t work for ambitious start-ups. If you have been in business for less than two years, your business would fall in to the Start-Up bracket, a company growing at 15% + per year is in the Growth category and large corporate businesses are classed as Established. 2. What is Equity finance? Equity finance means that you are selling shares in your company to inject funds. Equity finance is typically used by fast growing companies to finance investments that have a longer-term return. In return for the investment, the business usually gives certain rights to shareholders. This can include making annual payments to shareholders, rights to be consulted on key decisions or represented on the company's board. Investors can also help you grow your company, and some may be willing to provide mentoring and other support. Taking on debt means that you are retaining your ownership of the company - but also means that you are not sharing the risk for growing your business with other investors. You will have to repay loans or other forms of debt according to an agreed schedule. Many start-ups or very young companies struggle to get access to loans as lenders want to see a track record that ensures the company can pay-back the loan or the company has assets that can be used as security. Accelerators combine seed capital and mentorship - often in a 3-6-month programme that may culminate in a "demo-day" where start-ups pitch to investors. 5. How does Crowdfunding work? If a small business is rejected for finance by the big banks they are now obliged to offer the business a referral to a designated, online finance platform. These platforms give alternative finance providers the opportunity to offer viable businesses, the finance they need. At Funding Xchange, we have over 45 lenders waiting to compete for your business and a team of Business Funding specialists on hand to help you identify the best funding for you – whatever the reason.